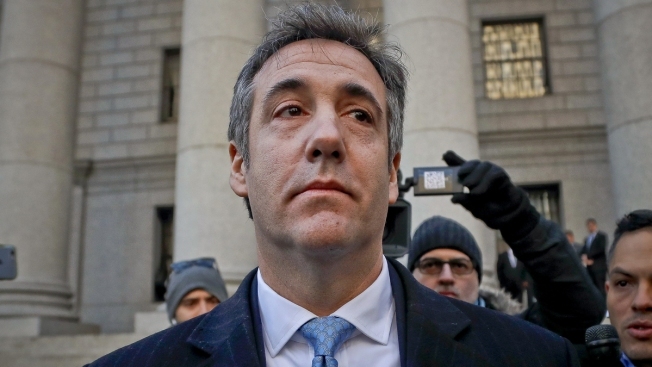 In this Nov. 29, 2018, file photo, Michael Cohen walks out of federal court in New York. Amid talk that former Trump lawyer Michael Cohen again lied to Congress, Cohen's lawyer sent a letter Tuesday to the head of the House Oversight Committee clarifying Cohen's testimony that he never sought a pardon from the president. Michael Monico told Rep. Elijah Cummings, D-Md., in the letter that Cohen, once President Donald Trump's personal attorney, had asked his lawyer to explore the possibility of a pardon before Cohen left a joint-defense agreement and turned against Trump last June. Cohen hasn't done so since, Monico said. Monico denied Trump's claim, in a tweet last week, that Cohen had personally asked him for a pardon. Cohen's public committee testimony last month "could have been clearer and more complete" when it came to pardons, Monico wrote in the letter obtained by The Associated Press. 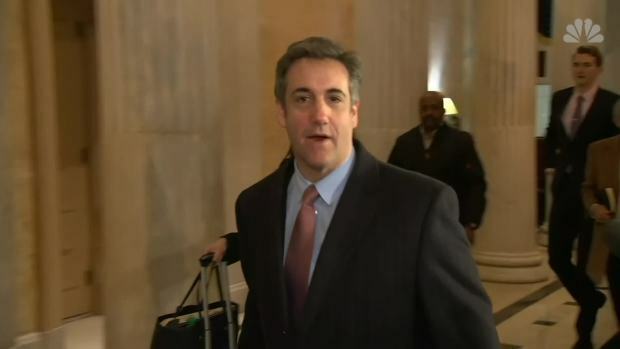 Cohen's remarks about not seeking a pardon pertained to the time after his split from Trump, Monico said. Michael Cohen turned over new documents related to a scrapped Trump Tower project in Russia, the subject he lied about to Congress in 2017, when he returned to Capitol Hill for another day of testimony before the House Intelligence Committee. House Democrats are ramping up investigations, based in part on Cohen's explosive public testimony last week, including details of hush money payments made during the campaign. "In retrospect, while the sentence could have been clearer regarding the time frames, the sentence is true, and Mr. Cohen stands by his statement," Monico wrote. Cummings' office didn't immediately respond to messages. Congressional investigators appeared to be zeroing in on the president's pardon power as Democrats embark on a series of sweeping investigations into Trump's political and personal dealings. Cohen declared under oath on Feb. 27 that "I have never asked for, nor would I accept, a pardon from President Trump." 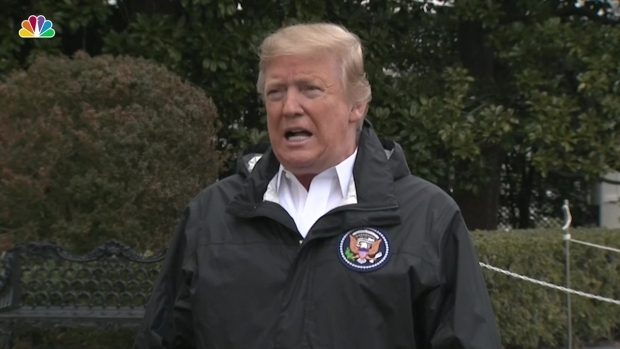 That statement, with millions of people watching on television, set off a firestorm that culminated on Friday with Trump's tweet calling Cohen a liar and alleging he had "directly asked" for a pardon. Before that, Cohen's lawyer and spokesman, Lanny Davis, and Trump lawyer Rudy Giuliani went back and forth in dueling interviews, trading their own versions of events. President Donald Trump and his former personal lawyer, Michael Cohen, accused each other of lying over whether Cohen had ever sought a pardon from Trump. Cohen testified to Congress that he hadn’t, but Trump insisted that Cohen did. "Bad lawyer and fraudster Michael Cohen said under sworn testimony that he never asked for a Pardon," Trump tweeted. "His lawyers totally contradicted him. He lied! Additionally, he directly asked me for a pardon. I said NO. He lied again!" Cohen, who is slated to begin a three-year prison sentence in May, denied that in a tweet of his own minutes later. He called Trump's allegations "just another set of lies." Monico reiterated that denial in his letter to Cummings, saying Cohen never asked Trump for a pardon and that Trump never offered one. Monico said Cohen had asked his previous lawyer to ask about a possible pardon after an FBI raid on his New York City home, office and hotel room in April 2018 because Trump had "publicly dangled the possibility of pardons when commenting about ongoing investigations." "With that in mind, as a past member of the joint defense team, Mr. Cohen asked his then attorney to discuss with another Trump attorney possible pardon options consistent with the President's prior public declarations," Monico said. Nothing ever came of that effort, he said. Giuliani said last Thursday he was contacted in May or June about a possible pardon for Cohen. He said his answer was that the president "is not going to consider or give any pardons now." "As I have said in the past, the president has the right to, and that doesn't mean he won't consider it when the investigation is over," Giuliani said. "But there are no plans to do so." As controversy grew over Cohen's pardon remarks, his legal team stressed that he was one of Trump's closest confidants and if he wanted a pardon, he would have just asked Trump himself. There is nothing inherently improper about a subject in a criminal investigation seeking a pardon from a president given the president's wide latitude in granting them. But investigators want to know if the prospects of presidential pardons were somehow offered or used inappropriately. Congressional investigators are also looking into whether anyone on Trump's legal team tried quietly to reach out to Cohen last year before he turned on the president and as his legal problems mounted. The House Judiciary Committee, which is conducting a probe into possible obstruction of justice, corruption and abuse of power, sent letters to the FBI, the Justice Department and others for documents related to possible pardons for Cohen, former national security adviser Michael Flynn and former Trump campaign chairman Paul Manafort. All three have been charged in special counsel Robert Mueller's investigation into possible coordination between Russia and Trump's presidential campaign. Associated Press writers Chad Day, Jonathan Lemire and Mary Clare Jalonick in Washington contributed to this report.